¡Hola! I have been away from posting recipes for a while, but today is a special day in Mexico, it is Día de la Candelaría, which is a catholic celebration and if you read my post about King’s Day when we do in Mexico Rosca de Reyes (King’s ring cake), you will know that today my daughter had the duty to make tamales as she was the one to find the little doll in the cake, so I though it would be a good idea to get her involved in cooking tamales and to teach her about our lovely traditions about mexican food. 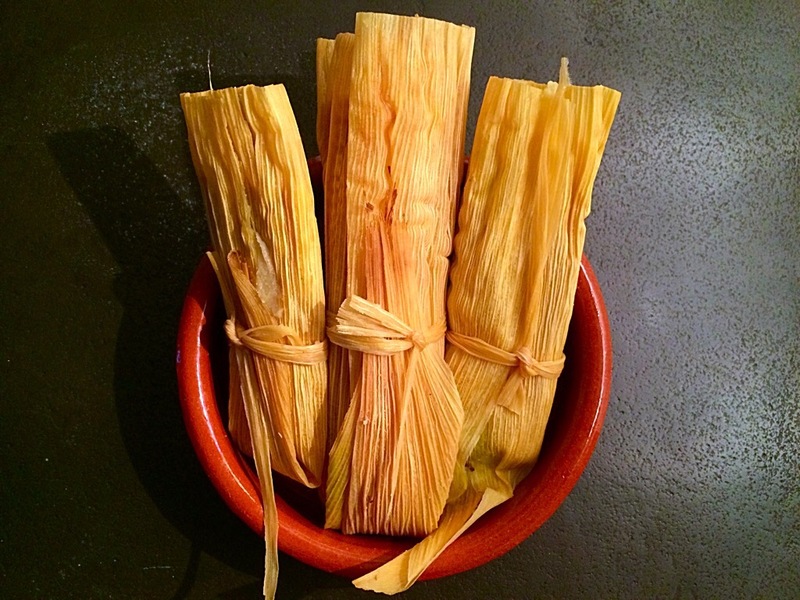 In Mexico we tend to eat tamales on this special day because tamales are a celebration food, it has been present since ancient times to pay tribute to Gods, so therefore every time that we celebrate something tamales are the star of the show. A tamal is nothing else than a parcel filled with flavoured corn dough and some sort of guisado (stew) as a filling, you can find tamales con rajas y queso (cheese and chilli strips), puerco (pork), pollo en salsa verde (chicken in green salsa), res (beef), frijol (beans), dulce (sweet) and many other. Today my daughter Miah and I are making tamales con pollo en salsa verde (chicken in green salsa tamales), they are very easy and quick to make and when they are done they taste delicious. We are not doing a lot of them as we are only making them for dinner. First prepare the chicken. Cook the chicken breasts with some water, half an onion, clove garlic and salt to taste. While the chicken is cooking prepare the salsa. Put the tomatillos, coriander, garlic, onion, jalapeños and salt in a blender and blend until smooth. Place the salsa in a saucepan and cook. Once the chicken is cook, take it out of the boiling water to cool down and then shred and add it to the salsa and cook for 15 min and set aside. Soak the corn husk leaves in warm water for 10 min. Make the corn dough. Mix all the ingredients and work the dough until it doesn’t stick in your hands. Take the corn husks out of the water and drain them for 1 min, then make a ball of corn dough (size of a golf ball) and spread the dough evenly in the middle of the corn husk then add one tbsp of chicken in green salsa and close the corn husk in order to keep everything inside. Repeat the proces until all the dough is finish. Place the tamales in a steamer for 1 hr approx or until the dough looks firm and comes out of the corn husk easily. Enjoy them with some refried beans and a nice atole or beer. Que rica receta, muchas gracias! Una pregunta, la harina maseca es la de tortillas o la de tamales que venden en mexgrocer?